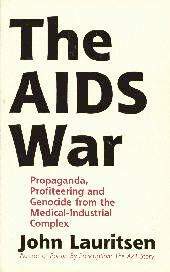 "The first casualty when war comes is truth"
Analogies to war are frequently used in the discourse on AIDS, and a cogent case has been made that, on the level of group psychology, AIDS is the equivalent of war. (1) It is arguable just how far the analogy can be taken. For example, if AIDS is war, what are the opposing forces? One can easily identify the victims of aggression as being gay men and drug users, the two main "risk groups," but it is more difficult to define the aggressors. Casper Schmidt, in his brilliantly original essay, "The Group- Fantasy Origins of AIDS," hypothesizes a "sacrificial witch hunt, in which the participants are the Moral Majority and an assortment of other conservative groups (as hunters) and the nation's drug addicts and homosexuals (as hunted). "(2) In support of his thesis Schmidt cites such activities of the New Right moralists as Anita Bryant's phenomenally successful campaign, "Save Our Children [From Homosexuals], Inc.," the literal "Declaration of War" by Jerry Falwell's Old Time Gospel Hour, and the proliferation of bumper stickers urging: "KILL A QUEER FOR CHRIST." On one level, perhaps even on the core level, I think there is validity to Schmidt's paradigm. However, certain features of the AIDS epidemic are hard to assimilate to a war model. One has to consider, for example, the immense profits being made by the Medical Industrial Complex, the precarious prestige of the United States Public Health Service, and the vested interests of the various research syndicates. There is also the fact that many of those playing leading roles in the extermination of gay men are themselves gay men, and many of these "traitors" have already died of AIDS. This would seem to be unusual behavior for a war, though perhaps not for a sacrificial ritual. The war analogy seems stronger on the issue of genocide. The AIDS epidemic is an epidemic of lies, through which hundreds of thousands of people have died and are dying unnecessarily, billions of dollars have gone down the drain, the Public Health Service has disgraced itself, and Science has plunged into whoredom. The official AIDS paradigm - including the preposterous notion that a biochemically inactive microbe, the so-called "human immunodeficiency virus" (HIV-1), causes the (at last count) 29 AIDS-indicator diseases - represents the most colossal blunder in medical history. But it is more than a blunder. In the course of this book it will become plain why I have employed the metaphor of war: the terrible suffering and loss of life, propaganda, censorship, rumors, hysteria, profiteering, espionage, and sabotage.